The Winter Weather is sure coming on strong here in North Carolina and if you are anything like me you were more than prepared about a month ago… A Florida Christmas was pleasurable but I would definitely prefer a white Christmas anytime! However, I will take what I can get! This past week has been busy working on getting a schedule for the New Year because I am starting this year organized and totally in charge of everything! it May not end that way, but I am certainly going to try! Got any secrets on how you stay organized, healthy and on top of things I would love to hear them! OH!!!! And DON’T FORGET! Sign up for Not Too Shabby Gabby’s Email List to ensure you never miss a post or healthy tip again! It is a weekly list so you will not get overwhelmed with emails! 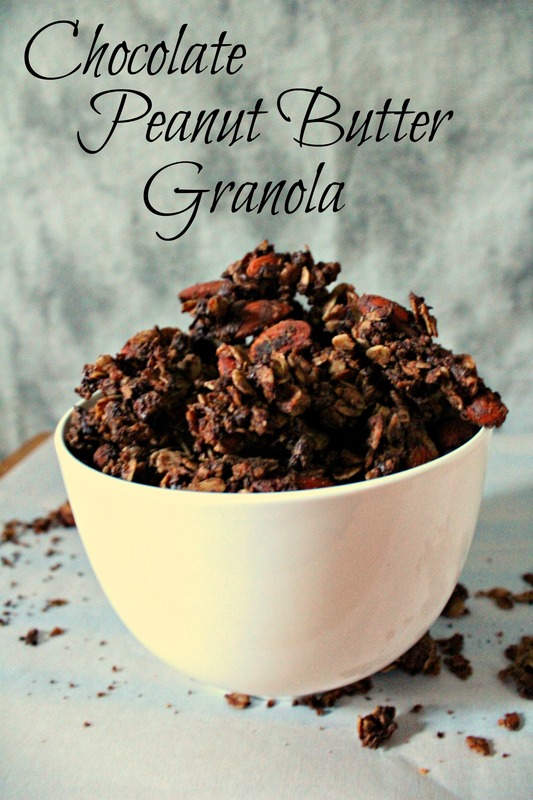 Today, I am continuing my theme of keeping healthy and active with this chocolate peanut butter granola! Any chocolate peanut butter lovers out there will fall madly in love with this delectable granola and it is completely vegan friendly too! In fact, it is so super healthy you won’t be able to even taste how healthy it is! Those are the kinds of snacks and dishes I like! I just had to share with you all about how amazing this granola is that I couldn’t keep it to myself or well I probably could…. but I will share! You all deserve it! 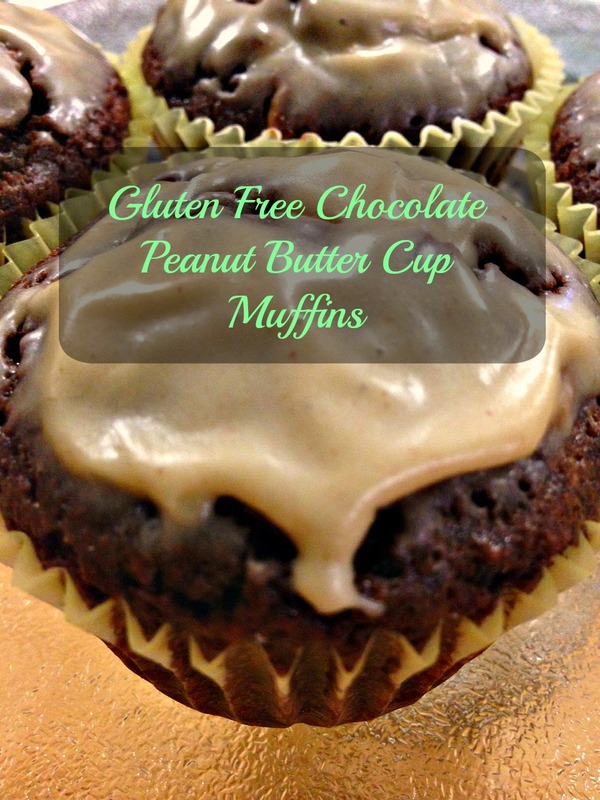 Mix together your Oats, almonds, cocoa powder, sugar and flax seed. Melt your coconut oil and mix your powdered peanut butter. Add in your oat mixture stir until everything is evenly coated. Spread out onto a prepared cookie sheet. I lay out a piece of Aluminum foil and spray it with nonstick spray and then spread it out. Put into preheated oven and baked for about 30-35 minutes stirring every 10 to 12 minutes. After it is done Baking Add your Chocolate chips in immediately and stir until all the chocolate chips have melted or started to melt. 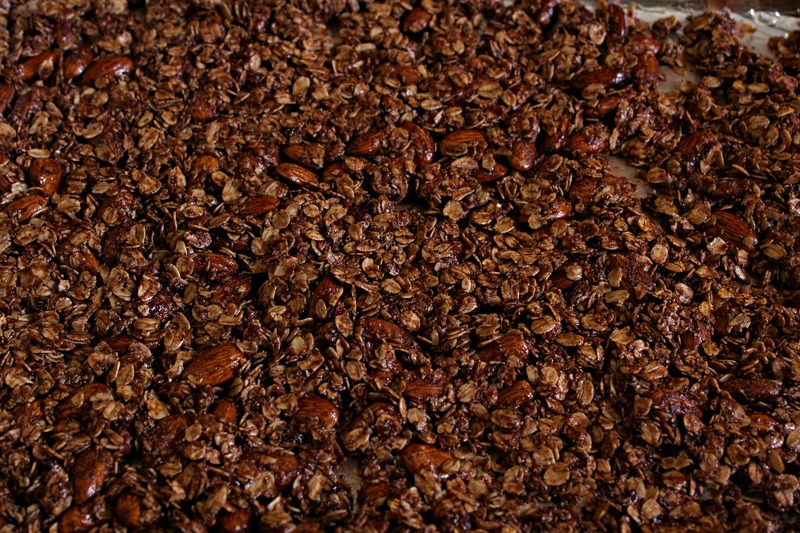 This will create even bigger chunks in the granola. Place in fridge for about 15 minutes to cool. Break apart and put into a zip-loc baggy or sealed container for up to 1 month. 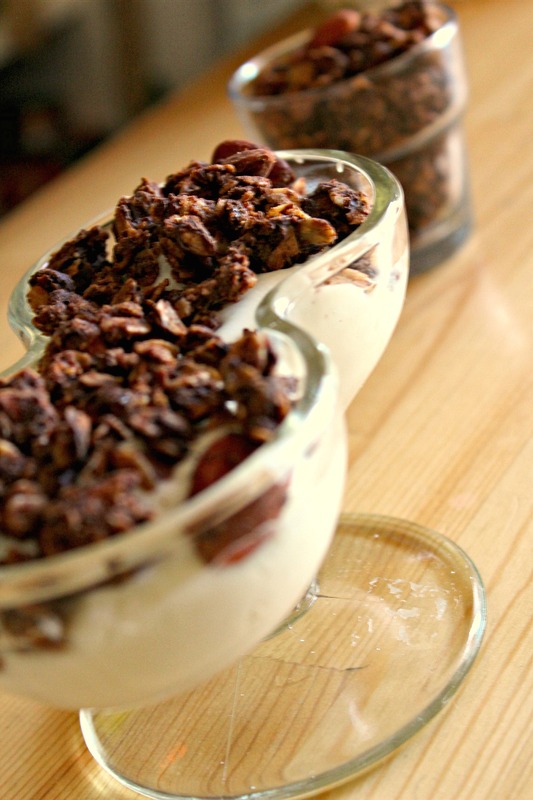 A delicious granola that has peanut butter chocolate lovers screaming for more! Vegan and of course gluten free to help with all types of diets! In my apartment the chocolate peanut butter granola does not last long. We have it for breakfast every morning until it is gone and we also will take it for snacks to work! It keeps us feeling full until the next meal and pairs perfects with some vanilla yogurt! It is also great to take on hikes in the spring and summer when the weather is feeling mighty fine! I love making a couple batches at a time so that it will stay around longer… maybe a week! The almonds are a great addition but any nut will do. It is great to add some peanuts to give it a more peanut buttery taste but the almonds give it more of a crunch and different taste. Doing half and half is great too. Don’t forget to follow me on Instagram (@notshabbygabby), Twitter (@Not2ShabbyGabby), Pinterest (@Not2ShabbyGabby) and Like me on Facebook to stay up to date on all recipes and posts! Don’t forget to sign up for e-mails too! I hope you have a blessed and great day! I feel like I have taken too long between updates and mostly because I have felt so very busy with our store’s website. This summer has certainly flown right by! I cannot believe that it is already July! Time sure does fly by when your having fun! This week we have also become part of a Link Party. The Tips & Tricks Link Party! I am quite excited about this new adventure since I am still new to the blogging world.